The name Oerlikon is probably more associated with the manufacture of the famous 20mm anti-aircraft gun made by Oerlikon Contraves. However, Werkzeugmaschinenfabrik Oerlikon-Bührle were a separate company until their merger with Oerlikon Contraves in 1989. Founded in the Oerlikon district of Zurich in 1907, Schweizerische Werkzeugmaschinenfabrik Oerlikon (SWO) became a highly diversified manufacturer of electro-mechanical goods, including alternators for the hydro-electric sector, electric motors and control gear, trains, trams, trolley-buses and machine tools at the larger end of the scale. 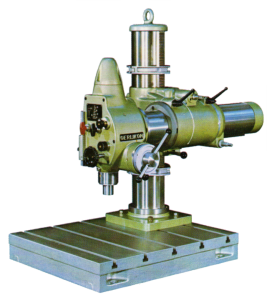 For the home machinist, the machine of most interest is the wonderful UB2 drilling machine, although some of the smaller lathes could also appeal.